With so many cookware options out there, how do you narrow down which pan will fit your needs. Better yet, what if you are shopping for someone else? How do choose what may work for the giftee? There are a few things you should consider in a pan. SlipStone is one that fits all of these tips. Let’s narrow down our search! Safety: Look for a pan that is free from harmful chemicals in the coating or construction. You want to make sure it states it is PTFE-free. Type: There are several types of pans. Decide if you need non-stick, cast iron or stainless steel construction. Consider size and weight. Construction: A pan made right will not require added grease or oils to prevent sticking. SlipStone is an example of non-stick construction that does not need grease. You know this because of its aluminum construction with a 4-layer non-stick surface. Also, a well constructed pan will cook your food evenly. Having a stone surface is a natural cooking state and will hold juices. Care: Know the rules of caring for our pan or you will severely shorten its life span. Most pans (except cast-iron) are dishwasher-safe and SlipStone is as well. However, I never put my non-stick pans in the dishwasher. You can simply take a well-coated pan like SlipStone and hand wipe easily with some water and soap if needed. SlipStone has a unique feature making care so much easier-it has a folding handle. No more shoving pans into your cupboard which can cause scratches and abrasions. So don’t focus on this as much as a novice cook will care for their pan in their own way. Nothing makes a better gift than opening up a good, quality pan! 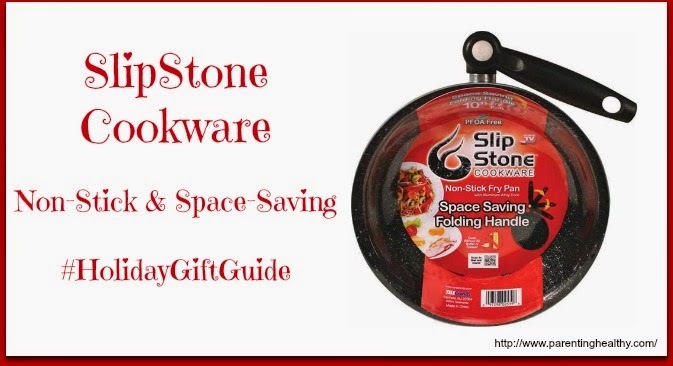 Remember SlipStone for your Holiday gift ideas. They are at retailer near you. I would love to try out one of these frying pans. I have only seen one commercial on tv about them.